If there's one thing I like stocking my freezer with, it's puff pastry. Pepperidge Farm is one brand I usually keep on hand. The other one I like is Dufour Pastry Kitchens brand, however it can be hard to find. Nonetheless, with puff pastry, I'm never too far away from whipping up some great appetizers to serve guests or just to snack on. My parents are visiting from overseas and I made these Pesto Palmiers as a snack the other day. My mom especially is a fan of the buttery, flaky layers that puff pastry is known for so it was no surprise she loved these! I've never attempted to make my own puff pastry however I hope to someday. Until then, it's so easy to just use prepared puff pastry. I must admit I much prefer savory palmiers than sweet since the filling options are endless and can capture all sorts of flavors. 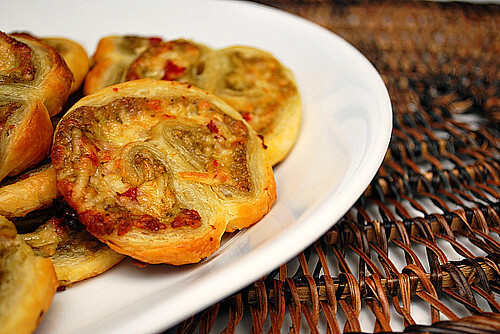 These savory palmiers are filled with homemade pesto, sundried tomatoes, toasted pine nuts and a blend of Parmesan and Asiago cheese. The original recipe called for goat cheese so feel free to try this recipe with goat cheese as well. Lightly flour a board and carefully unfold one sheet of puff pastry. Roll the pastry lightly with a rolling pin until it's 9 1/2 by 11 1/2-inches. Spread the sheet of puff pastry with half the pesto, then sprinkle with half the each cheese, half the sundried tomatoes, and half the pine nuts. Sprinkle with 1/4 teaspoon salt. Place the walnuts, pine nuts, and garlic in the bowl of a food processor fitted with a steel blade. Process for 30 seconds. Add the basil leaves, salt, and pepper. With the processor running, slowly pour the olive oil into the bowl through the feed tube and process until the pesto is finely pureed. Add the Parmesan and puree for a minute. Serve, or store the pesto in the refrigerator or freezer with a thin film of olive oil on top. Your ingredients don't match your recipe- goat cheese isn't listed, asiago and parm are. ????? If you read the post above the recipe she says that she used Parm & Asiago (which are listed in the recipe) but that the original recipe called for goat cheese which you can "feel free to use as well". Either way they both sound great!